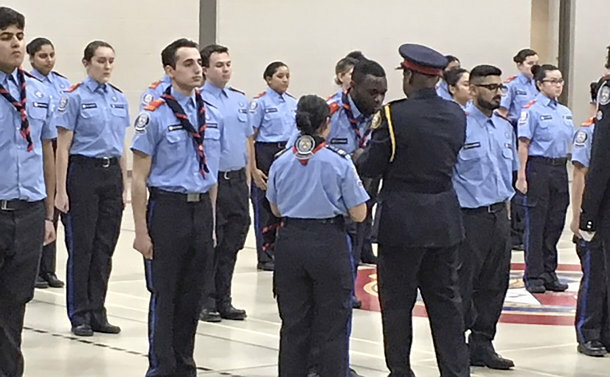 A new group of college students is stepping up to help their community as Toronto Police Service Rovers. 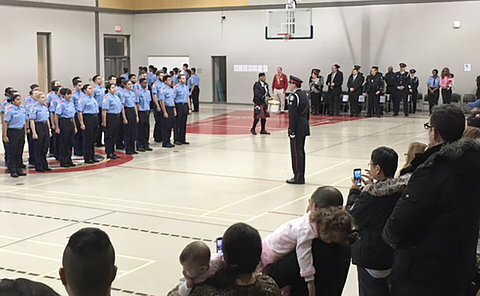 A total of 44 Humber College students joined the 22 Division Toronto Police Service Rover Crew at a ceremony in February at the Toronto Police College. From August to December 2017, the Rover Crew donated 2,168 hours in service of their community at a variety of events. From the 54 Division community barbecue, to the Scotiabank Toronto Waterfront Marathon and the Etobicoke Park Clean Up, to the Mothers Against Drunk Driving Red Ribbon campaign, the Humber RIDE (Reduce Impaired Driving Everywhere) check and various Santa Claus parades across the city last November, their volunteer work is valued by the Service. Founded by Police Foundation students at Humber College’s Lakeshore campus in 2003, the program is designed to prepare young people for the future by encouraging them to give back to the community, while also providing them with an insight into law enforcement. The members are students enrolled in Humber College’s School of Social and Community Services. There are now 74 active members who meet each Monday at either Humber College Lakeshore campus or the Toronto Police College.